The Hypno Gastric Band Hypnosis – is it a viable alternative to a real Gastric Band or Bariatric Surgery? Which is best for you Gastric Band surgery or virtual hypno gastric band hypnotherapy with weight loss hypnosis? The Hypno Gastric Band – a viable alternative for obesity? Many people have heard of Gastric Banding surgery because of celebrities such as in the UK Vanessa Feltz or Fern Britton and in the US Roseanne Barr and Diego Maradona. People who consider gastric band surgery may well have typically struggled with their weight – they have tried weight watchers and slimming world where they had to to count calories or eat a restricted diet such as the Atkins Diet or tried meal replacement shakes or the Raw food diet. There are so many diets and slimming approaches and many will have experienced weight loss and perhaps found themselves becoming obsessed or bored with food and “how many pounds lost today” – some will even starve them selves just prior to a weigh in session at a slimming club – just to show weight loss and then found that as soon as they stop calorie counting or using points or restricting their diet that they just go back to old ways of eating and put weight back on. It is also important what people are eating. In the US junk food is classified as “addictive” by the American Health Authority – it contains far too much fat sugar and salt and people are addicted to that taste so the US has two thirds of it’s population as obese and the UK has the fattest population in Europe at 69%. One American Burger chain has the Pizza Burger which has a whopping 2,000 calories on it’s own – that is in excess of the recommended daily amount for one male person. Even ready meals can be too full of fat sugar and salt. BBC 3 highlighted that diet drinks especially Diet Coke can actually make you hungrier if they contain aspartame. Low Fat Diet foods in the same programme actually turned a healthy eater, Zoe Salmon, who went on a Low Fat ready meals diet with diet drinks for a month, into a grumpy tired person grazing on snacks and she GAINED 3 pounds. Another important area is WHY people are overeating and we will come back to that point later. The gastric band begins to look like an attractive proposition and in this blog some of the the pluses and minuses and alternatives are explored. When does someone look at having gastric band or bariatric surgery? Typically some one looking at gastro band or gastric bypass or sleeve gastrectomy will be classified as obese. This is generally taken as being a Body Mass Index (BMI) of over 30. A rule of thumb might be that they are many pounds or stone overweight for their size. Problems are that they are physically carrying too much weight for their size and so putting a strain on skeleton and muscles – they will have knee and back problems. This is because if you think of a one pound lump of lard or fat and then multiply that by how much overweight you are. Then imagine slinging all that fat into a rucksack and carrying it on your front. What would that be like? Breathless, knees ache, back ache… tired all the time. That is what is happening when you carry excess weight. There are also significant health issues with being overweight and bad diet: osteoarthritis, type 2 diabetes and heart disease, lethargy, breathlessness and high blood pressure, cancer and much more. What variations of bariatric surgery are available? There are a number of different approaches to weight loss surgery – broadly speaking there are the types that remove part of the stomach (sleeve gastrectomy or biliopancreatic diversion with duodenal switch) or by resetting and re-routing the small intestines to a small stomach pouch (gastric bypass) or, simplest, reduce the size of the stomach by implanting a lap-band or adjustable gastric band. All the approaches have the goal of making you feel fuller sooner. This simple mechanical change of the size of the stomach means that the hypothalamus, governor of the appetite, receives a message sooner than previously which means that you feel fuller earlier than in the past – you eat less and you therefore lose lots of weight in theory and often in practice. The food arrives at the new reduced sized area and fills up very quickly – stimulating the I AM FULL feeling – the food then passes slowly through the new area and is digested as normal. The Laparoscopic Adjustable Gastric Banding – Lap-band or gastric band – is one of the most common procedures. Basically small incisions are made and a T shaped hollow tube with two ports either side and one at the top – the trocar – is used to guide small instruments into your abdomen and using a laproscope – a small camera – to see what is happening a passage is made around the top of the stomach and a small pouch is formed about the size of a golf ball by using a hollow tube band – which looks a bit like a tubular belt with an access tube attached. At the end of that tube is a funnel shaped port. The gastric band is itself hollow. Once the band is fitted around the top third of the stomach it is secured and the other end with the funnel shaped port is anchored in the abdominal area. The band is filled with saline solution and can be tightened or loosened via the funnel shaped port in the abdomen. Costs for these interventions range from £5,000 to £10,000 or more. If all goes well in surgery they will do what they advertise and help with great weight loss and keeping it off. 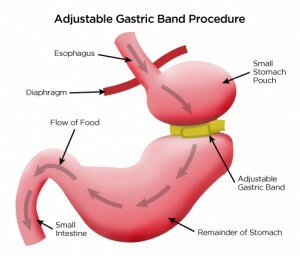 What are the drawbacks of gastric band surgery? Surgery is always risky. There have been cases of botched surgery when people have gone for a cheap option in a place in the World where surgery standards may not be so high. There are sometimes cases of septicemia or infection. Some people complain of feeling sick or uncomfortable all the time. Before you can have the procedure the gastric or bariatric surgeon will be looking to see that you stablise blood pressure and get down to a manageable and stable weight. If you have a heart condition the risks are increased. The problem with weight loss surgery as with dieting and slimming is mindset. There have been cases where people have tried to go back to overeating and pureed food to get past the obstruction because they haven’t dealt with their overeating issues. What is the problem with mindset and weight gain? Binge or Comfort or Emotional eating – because they are tranquillising anxiety or emotional pain or stress – for example. Self defence – “If I am overweight no-one will come near me”. Therefore if people have not dealt with WHY they overeat – they will eventually go back to the familiar ways that make them feel better. Let us consider a car. There are dials and lights on a car dashboard that tell us when the oil is low or the radiator needs water or there is some other problem. These warning lights are good. Unless the warning is that the car is low on fuel – putting more fuel in the tank won’t fix the problem. Feelings are like those lights and they are there to warn us to take action. Making a plan to address those problems is always better than eating to feel comfortable. Unfortunately many of these responses are learned in childhood – an eight year old gets anxious and is pacified with sweets. A child is told to always clear their plate. These responses do not help us govern our appetite! So what is the virtual hypno gastric band and weight loss hypnosis alternative? Weight loss hypnosis should help to address eating issues – the WHY of overeating with a combination of hypnoanalysis, hypnotherapy and NLP to discover, understand and reframe the eating issues. Weight Loss Hypnotherapy should ideally combine this with motivation and nutritional advice. The Hypno Gastric Band comes in as many flavours as gastric banding – Mind Band, Hypnotic Gastric Band, HypnoGastricBand and more. The aim is at the end of a course of weight loss hypnosis to put the client into hypnosis and give them the experience of the Gastric Band operation. The subconscious mind doesn’t really distinguish between this imaginative recreation and the real thing – so with a carefully constructed approach a client has the notion of the gastric band in place. My preferred option is the Hypno Gastric Band. As the client had already been through weight loss hypnosis and understands their limiting beliefs regarding eating and has begun to use the motivation of hypnosis and NLP and nutritional information to change the way that they eat and what they eat – then the package offers an alternative to the real Gastric Band for the obese and typically at a cost from £260 – £350 for a weight loss course with the Hypno Gastric Band at the end. This months BLOG from Graham Howes Hypnotherapy – Howe to stop smoking. Whether you’re a teen smoker or a lifetime pack-a-day smoker, quitting can be tough. But with the right game plan tailored to your needs, you can replace your smoking habits, manage your cravings, and join the millions of people who have kicked the habit for good. Managing unpleasant feelings such as stress, depression, loneliness, fear, and anxiety are some of the most common reasons why adults smoke. When you have a bad day, it can seem like cigarettes are your only friend. Smoking can temporarily make feelings such as sadness, stress, anxiety, depression, and boredom evaporate into thin air. As much comfort as cigarettes provide, though, it’s important to remember that there are healthier (and more effective) ways to keep unpleasant feelings in check. These may include exercising, meditating, using sensory relaxation strategies, and practicing simple breathing exercises. For many people, an important aspect of quitting smoking is to find alternate ways to handle these difficult feelings without smoking. Even when cigarettes are no longer a part of your life, the painful and unpleasant feelings that may have prompted you to smoke in the past will still remain. So, it’s worth spending some time thinking about the different ways you intend to deal with stressful situations and the daily irritations that would normally have you reaching for a cigarette. A popular option that has produced good results. Forget anything you may have seen from stage hypnotists, hypnosis works by getting you into a deeply relaxed state where you are open to suggestions that strengthen your resolve to quit smoking and increase your negative feelings toward cigarettes. A Lancet study of one million Women shows that if you stop smoking before you are 30 – your chances of dying of smoking related disease are small. Stop at 40 and you lose a year of your life. Beyond that you lose 10 years of your life. 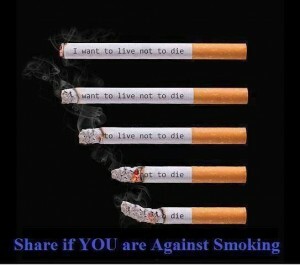 Actually other studies show you have a one in three chance of dying if you smoke.